In the new year things will get serious! My kendo glasses are being made, so I can start wearing my men. That completes my bogu, as I've already been wearing the do, kote and tare. Which means that yes, I'm going to get into real geiko and I can compete in shiai! And as I have mentioned before I'll jump into the deep end in 2012! January will see our next kyu examinations and in February I'll join the kyu-grade tournament. I need a second shinai, as backup should the first one be damaged. I need a zekken, the name card that identifies a kendoka. I'll need to do a few repairs on the bogu that Ton sensei loaned me. Most notably, I'll be replacing the himo (belt/straps) of the tare since they are completely worn through. The design for my zekken is shown on the left. Along the top is the name of our dojo, Renshinjuku (錬心塾) and along the bottom is my surname. 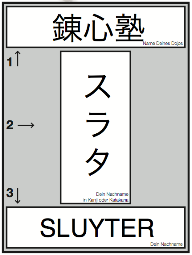 The middle is a repeat of my surname, but in katakana, which reads SURATA. The fine folk at kendo24 are on holiday this week and my favored shinai (the "kenshi" model) is sold out, so I hope my order will reach Almere in time. Left: Sp = -10.25, was -9.50 in december 2009 and -9.00 in december 2006. Right: Sp = -10.25, was -9.75 in december 2009 and -9.50 in december 2006. Today I ordered lenses for my kendo glasses, which have priority as my first tournament is up in february. In January I'll go back to the shop with Marli, so we can pick out frames for new day-to-day pairs. At least the price is right at SpecSavers! I'm getting lenses with an RI of 1.6 and they come at 95 euro for the pair. Not a-piece, but for the pair! The SpecSavers will charge me 50 bob to cut them and install them in my frame. That's -still- half of what we used to pay at Pearl! A few months back we discussed how incorrect log settings can mess with your auditing and logging in "Mind your log files!". Today we'll take a look at another way your logging can go horribly wrong. Case in point: keystroke logs. BoKS' suexec facility comes with optional keystroke logging, which allow you to capture a user's input and output. This is particularly handy when providing suexec su - user access to an applicative or super user. These keystroke logs are stored locally on the client system, where they are hashed and filed. The master server will then pull these log files from each client for centralized storage, after which the files will be cleaned from the clients. Optionally, these log files will then be pushed to replica servers for backup purposes. Things go awfully wrong when the master server's kslog storage is underdimensioned. Once the storage location for keystroke logs is filled, the master server will stop pulling and cleaning files from client systems. This means that $BOKS_var/kslog, which is meant for temporary storage, now becomes rather permanent storage. 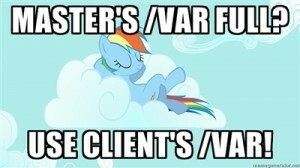 And since many BoKS administrators leave $BOKS_var as part of the /var file system you are now filling up /var. If the BoKS client system is not protected against a 100% filled /var you are now looking at a very, very nasty situation. You might end up crashing client systems, or causing other erratic behaviour. Properly dimension your central storage for BoKS logging. Apply proper monitoring to your central storage for BoKS logging. I'm very much looking forward to 2012. In january we will have our next exams and in february I plan on taking part in the kyu-grade tournament with Martijn. That means I'd better get a move on with my kendo glasses as I'll need to be in full bogu for the tourney! Symptom: A customer of mine could use suexec su - oracle on a few of his systems, but not on some of his others. Troubleshooting: Everything seemed to check out just fine. The customer's account was in working order and neither root, nor the target account were locked or otherwise problematic. And of course the customer had the required access routes. So, why does BoKS keep saying that this user isn't allowed to use suexec su - oracle on one box, but it's okay on the other? 12/13/11 10:01:12 HOST2 pts/5 customer suexec Unsuccessful suexec from customer to root, program /bin/su. No terminal authorization granted. I thought it was odd that the logging for the failed suexec seemed "incomplete", but wrote it off as a software glitch. However, this is where alarm bells should've gone off! So I continued and everthing seemed to check out: on both hosts /bin/su was used, on both hosts oracle was the target user and the BoKS logging supported it all. So let's try something exciting! Boksauth simulations! $ suexec boksauth -L -Oresults -r 'SUEXEC:customer@pts/1->root@HOST2%/bin/su#20-#20oracle' -c FUNC=auth TOUSER=root FROMUSER=customer TOHOST=HOST2 FROMHOST=HOST2 PSW="iascfavvcfHc"
What I was expecting to see was STATE=6 and ERROR=203. But since the ERROR= field is absent and the STATE=9, this indicates that the simulation was successful. Now things get interesting! So I asked my customer to try the suexec su - oracle with me online, while I ran a trace on the BoKS internals. This resulted in a file 10k lines long, but it finally got me what I needed. In the course of the debug trace, BoKS went through table 37 (suexec program group entries) to verify whether my customer's command was amongh the list. It of course was, but BoKS said it didn't match! This threw me for a loop. So I went back to the original BoKS servc call that was received from client HOST2. And then it clicked! One final check confirmed that I'd been overthinking the issue! It turns out that HOST2 was still running BoKS version 6.0. While the suexec facility was introduced into BoKS aeons ago, only per version 6.5 did suexec become capable of screening command parameters! So a v6.5 system would submit the request as suexec su - oracle, while a v6.0 host sends it as suexec su. And of course that fails. The past few weeks I have been a bit frustrated with myself. Since coming home from Japan I haven't properly gotten back to my sports regime. Only last week have I tried to get back to running on a daily basis, which aggravates me because I walk the same piece of road on a daily basis. So why not run instead of walking?! Well, at least I'm not taking the buss to the office. But! I'm not quitting kendo! I enjoy this way too much and it's very educational, both physically and mentally. The social aspect of it is also very pleasant, as my classmates are cool guys. I am definitely not relaxed enough in my arms. Both sensei and another experienced kendoka remarked about my stance, especially my arms and my swing/strike. My arms tend to make a long triangle, instead of the "upside-down house", ie the square and triangle. Also, sensei noted that I start my upswing from a position where I'm upright and standing still. Instead he would like to see me start "falling" forward to gain distance before starting the upswing. Interesting mechanics right there! This should also allow me to actually do a proper fumikomi. Speaking of my upswing: it's angled and not straight. The tip travels over my shoulder instead of over the centerline.